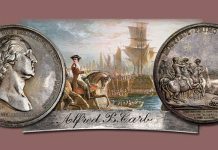 The United States Mint has unveiled the five designs that will be struck to mark the ninth year of the America the Beautiful Quarters Program. 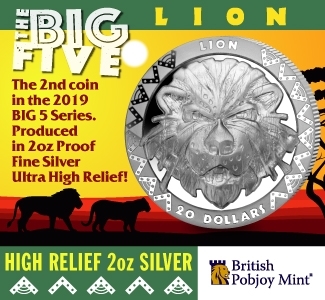 When the fifth and final design of 2019 is issued, the series will have grown to include 50 designs. The America the Beautiful Quarters Program began right after the completion of the 50 State Quarters Program and its adjunct District of Columbia and Territories program. 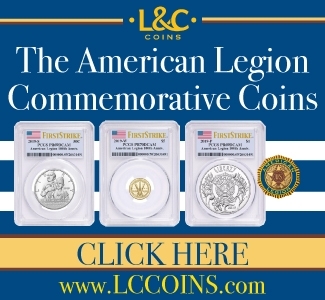 Authorized by Public Law 110–456 (source: PDF), the America the Beautiful National Parks Quarter Dollar Coin Act of 2008, called for the Treasury Department and the Mint to issue “redesigned quarters dollars emblematic of national parks or other national sites in each state, the District of Columbia, and each territory. 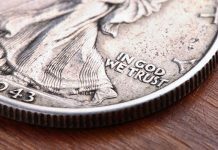 The 2019 quarters honor parks in Massachusetts, Idaho, and Texas, as well as memorial parks located in Guam and the Northern Mariana Islands. 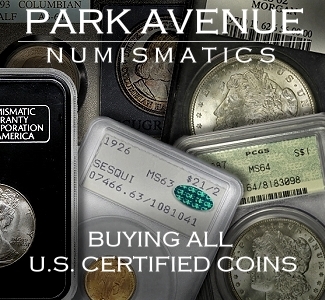 Each quarter will be issued at face value with examples struck at the United States Mints at Philadelphia and Denver. 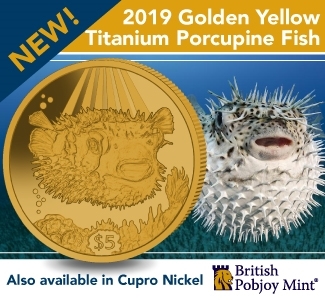 In addition, numismatic versions of each design, including Proof versions struck in .900 silver and copper-nickel clad, will be available to collectors starting in January 2019. 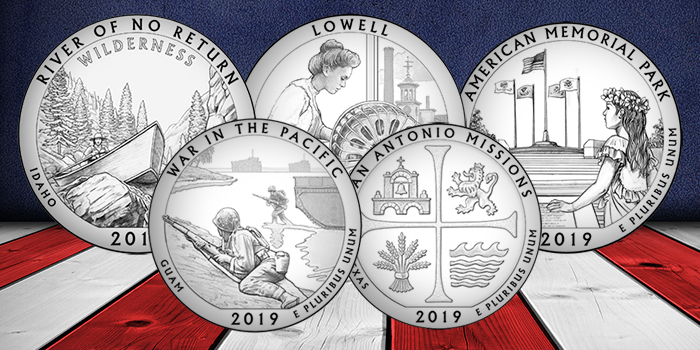 The first America the Beautiful quarter dollar to be issued in 2019 honors the Lowell National Historical Park. Located in Lowell, Massachusetts, the park preserves a number of important buildings that date back to the Industrial Revolution, when the city was a major center for the American textile industry. 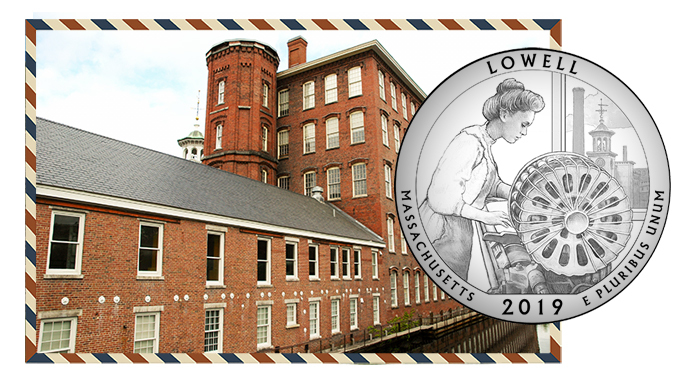 The Lowell National Historical Park quarter was designed by Joel Iskowitz and is the first of two Iskowitz designs chosen for the quarter program in 2019. United States Sculptor-Engraver Phebe Hemphill sculpted the design. The Northern Mariana Islands is the site of the American Memorial Park, a site dedicated to the service and sacrifice of American soldiers and the Mariana people, who fought together to repel Japanese forces during World War II’s Pacific Campaign. Today, the site serves as a memorial and a recreational park. On-site are walking paths, sports fields and courts, the Carillon Bell Tower, and the monument depicted in Donna Weaver’s quarter design. 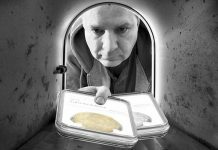 Weaver is a retired United States Mint Sculptor-Engraver, who now participates in the United States Mint Artistic Infusion Program. 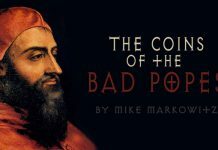 Weaver is the author of more than forty coins and medals, including three State quarters designs. This is Weaver’s fourth America the Beautiful quarter design. The American Memorial Park design was sculpted by United States Mint Sculptor-Engraver Phebe Hemphill. 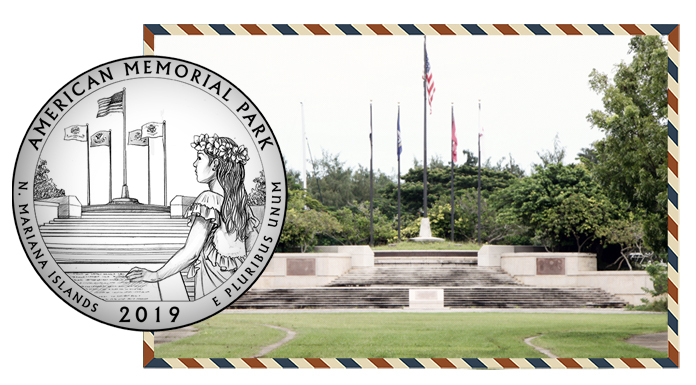 The Pacific National Historical Park in Guam will be honored with the third America the Beautiful quarter release of 2019. The War in the Pacific National Historical Park stands as a tribute to the bravery and sacrifice of those who fought in World War II’s Pacific Theater. 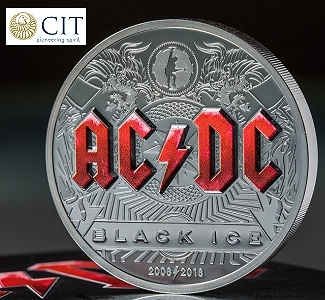 The coin’s design depicts American forces landing on the beach at Asan Bay as the battle for Guam’s liberation raged on in the summer of 1944. For the Americans, it was a hard-fought victory. The battle claimed the lives of 1,777 Americans and wounded 5,798. The Japanese forces, vastly outnumbered, fought to the bitter end, losing 18,337 of the nearly 20,000 soldiers charged with holding the island. 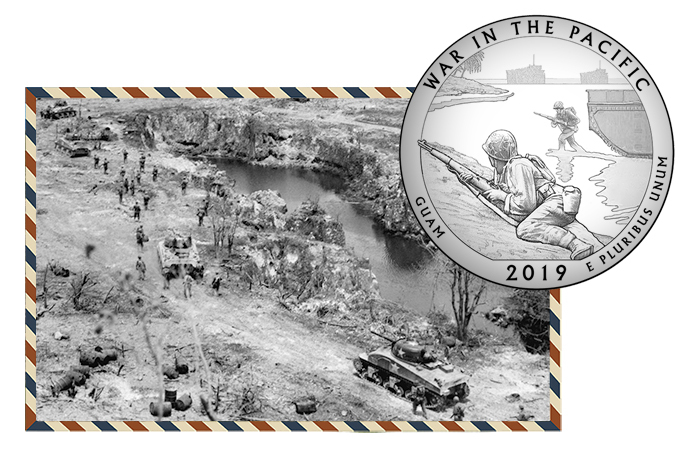 The Pacific National Historical Park – War in the Pacific quarter was designed by Joel Iskowitz and sculpted by United States Mint Sculptor-Engraver Michael Gaudioso. 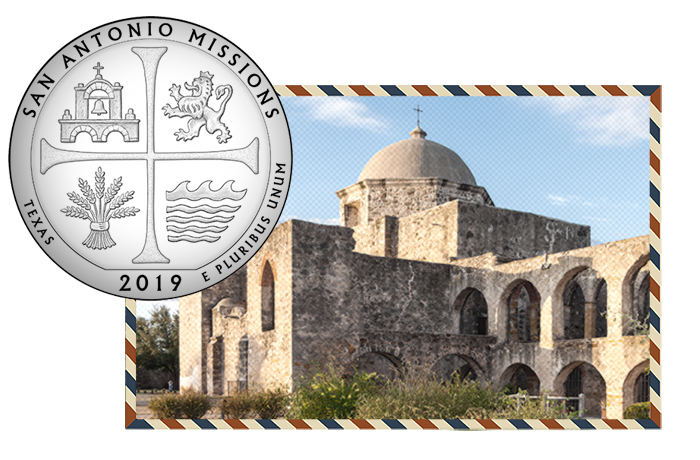 The fourth America the Beautiful quarter to be issued in 2019 will honor the historic Spanish missions of San Antonio. Erected between 1690 and 1720, the San Antonio missions served an important purpose for the Spanish crown, which sought to convert the local population to Catholicism and to promote Spain’s colonial conquest of the region. The San Antonio Missions quarter was designed by United States Mint Artist Infusion designer Chris Costello and adapted to sculpt by United States Mint Sculptor-Engraver Joseph Menna. 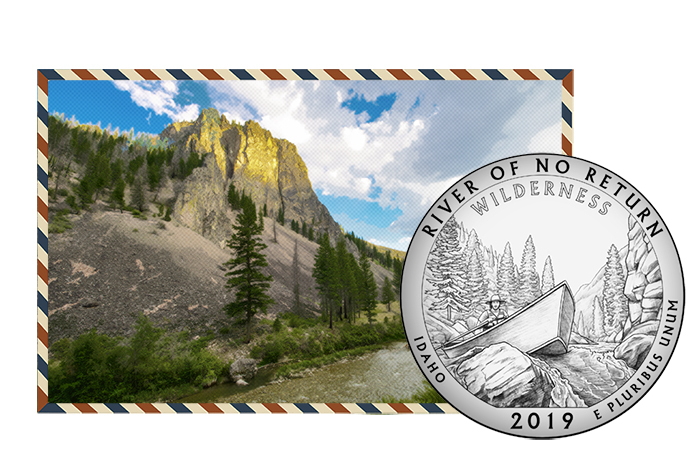 Costello has authored more than a dozen U.S. coin designs, including the 2017 Native American $1 coin reverse honoring Jim Thorpe and the 2014 America the Beautiful Great Smoky Mountains National Park quarter reverse. 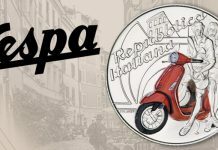 Menna has more than fifty published coin and medal designs and sculpts to his credit since joining the mint in 2005. The Frank Church River of No Return Wilderness, located in Idaho, is the largest single connected wilderness in the contiguous United States. The park was named after Democratic politician Frank Forrester Church, III, who served in the U.S. Senate from 1957-1981. Church was a leading advocate for the preservation of the site, which includes four national forests and several rivers and canyons. The design is the work of United States Mint Artist Infusion designer Emily Damstra. 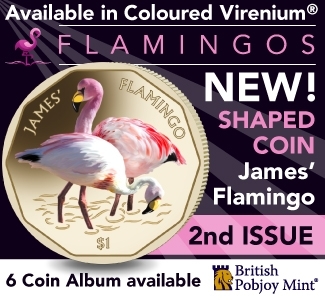 Damstra has designed more than 20 coins over the course of her career, including many coin designs issued by the Royal Canadian and the United States mints. 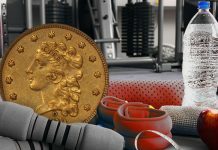 Her U.S. coin credits include the 2018 Breast Cancer commemorative obverse and reverse and the 2017 Boys Town silver dollar obverse and reverse. United States Mint Sculptor-Engraver Renata Gordon adapted the design to sculpt.